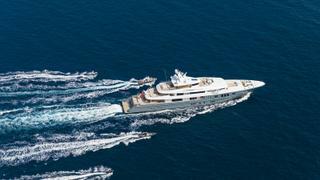 The 73.5 metre motor yacht Project 783, listed for sale by Imperial Yachts, has been sold with the buyer introduced by Burgess. Designed inside and out by Reymond Langton Design, she was built in steel and aluminium by German yard Nobiskrug to Germanischer Lloyd's class and MCA coded with delivery in 2012. She offers luxurious accommodation in six cabins, including a full-beam master suite with an exclusive folding terrace that offers 180-degree sea views at main deck level, a VIP guest suite opening onto the bridge deck and four guest cabins which provide flexible sleeping arrangements for guests, friends and family. All six cabins are furnished for utmost comfort and equipped with entertainment centres, television screens and en-suite bathroom facilities. Extensive and varied outdoor spaces allow guests to enjoy life on deck, with a generously proportioned exterior Jacuzzi, as well as various different inviting areas for al fresco dining and entertaining on each deck. Other key features of this superyacht include a luxury beach club, a gym on the sundeck and a fully equipped private indoor cinema as well as another on the sundeck. Twin 1,312hp MAN diesel engines give her a cruising speed of 12 knots, topping out at 14 knots and she is fitted with zero-speed stabilisers. The asking price of Project 783 has been witheld.